Looking for a quick, easy way to add Christmas to a small spot? Like beneath a small wall lamp, on an interior door, or on a narrow wall? 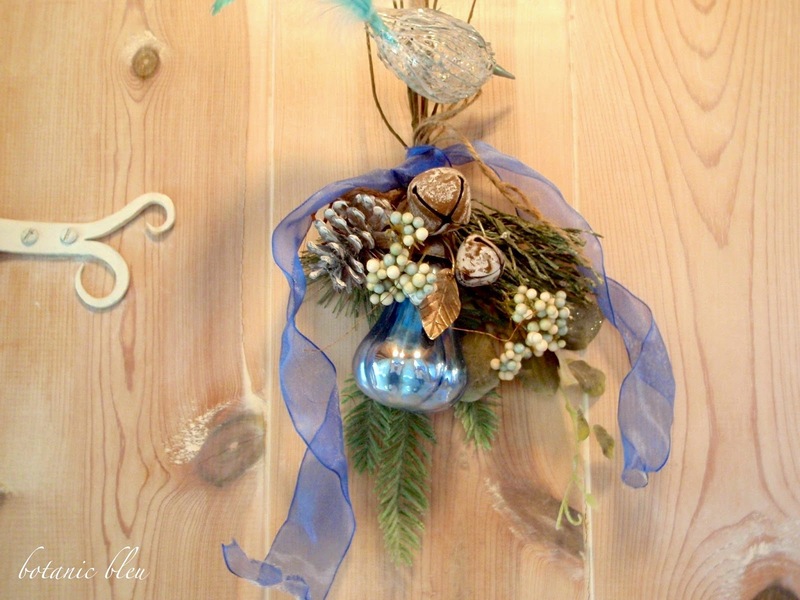 Christmas swags are easy to make and will add some seasonal color to all of these areas. Only three things are needed to make this traditional red and green swag hanging beneath a small wall lamp. 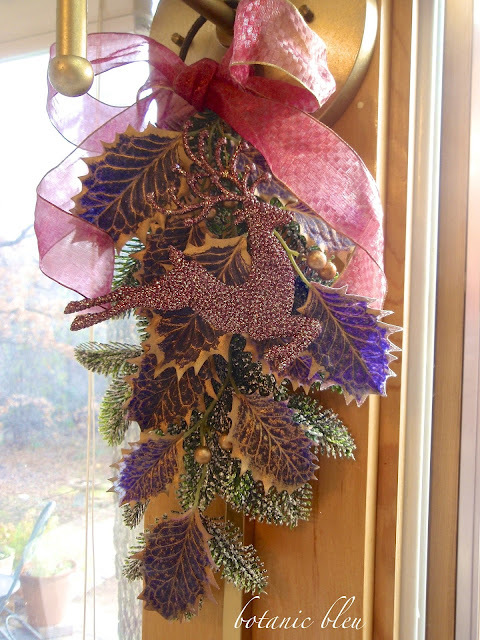 Instead of gluing parts of the swag together, use a small piece of the same ribbon in the bow to tie the artificial greenery and holly twigs together. Then continue to wrap the ribbon around the ends of the branches to give the swag a more finished look. Tie a large bow around the swag to hide the ribbon-wrapped ends. By using ribbon instead of glue to hold all the pieces together, the swag can easily be disassembled for its pieces to be used in other arrangements. Work with the greenery and holly twigs to pull them so that bits and pieces stick out at various depths to give a three-dimensional look. Do the same with the ribbon bow. Pull the bow loops forward and position the bow ends so that some of the ribbon is tucked into the greenery. The artificial greenery in this swag is the same greenery used in the first swag. Replace the red and green ribbon with a creamy white satin ribbon. 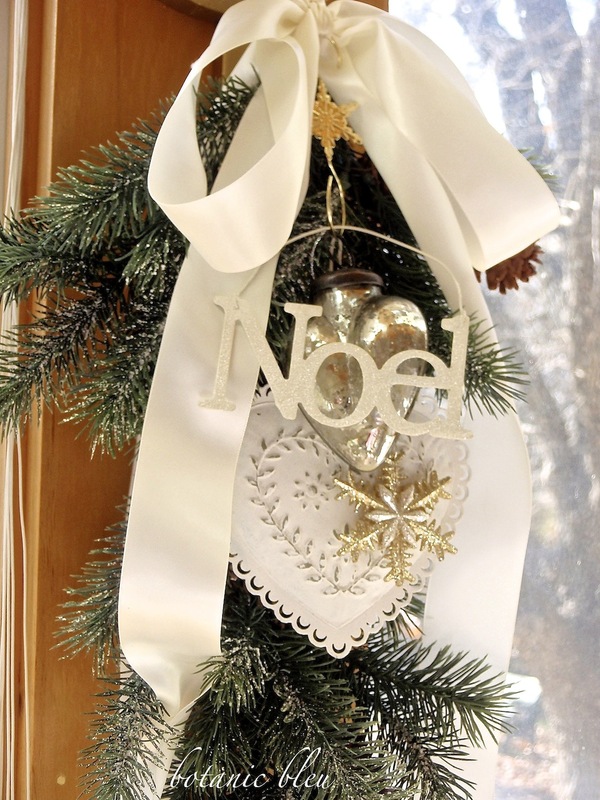 A decorative ornament hanger (see the gold six-sided star just below the ribbon's knot) hung through the creamy ribbon knot provides a hanger so several items can easily be added to the swag. Choose similar color items of various sizes and with their own individual hanging cords of varying lengths. Add the largest item (white pierced metal heart) first and use the longest hanging cord with it so this item hangs the lowest on the swag. Add a small item (gold glittery snowflake) next so that it hangs shorter than the largest item. Add a medium sized item (silver mercury glass heart) next so it hangs at the top of the largest item. Finally, add a Christmas word (Noël) so it hangs horizontally below the highest object. Part of the beauty of this swag is in the layering of thin, flat objects with three-dimensional ones. Pull out your Christmas ornaments to find three to four to use in place of the sample items shown. One of the nice things about making your own decorations is getting to use colors that coordinate with your home's existing color scheme. To create a similar look as above, use one leaf branch with gold berries that is the same length as the artificial greenery. Tie the two artificial stems together with your coordinating ribbon as before. A gold edge on the wired ribbon coordinates with the gold in the leaves. 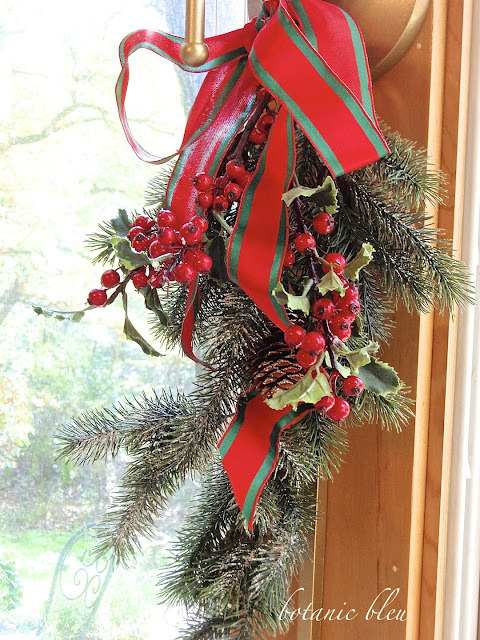 Hang one color-coordinated Christmas ornament by tying its hanging cord into the ribbon's knot, then make the bow loops. Use your fingers to curl large loose loops in the ribbon's ends so that they twirl on either side of the ornament. A large horizontal ornament looks better than a vertical ornament. 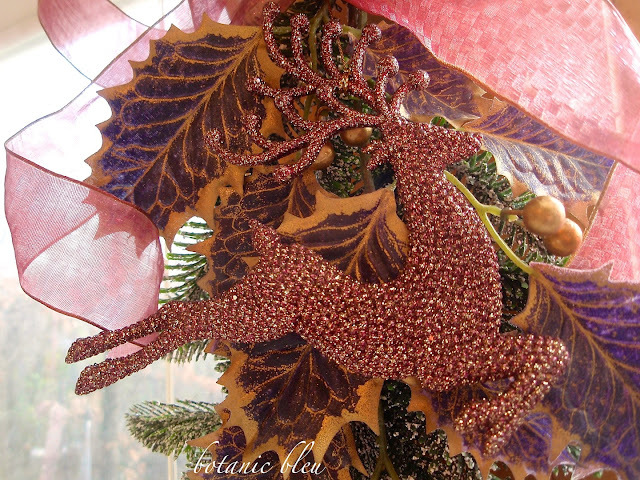 Shop for ribbons with sheen because they work well with glittery looks like the reindeer's look. An inexpensive ready-made small swag can be embellished to add your own colors. 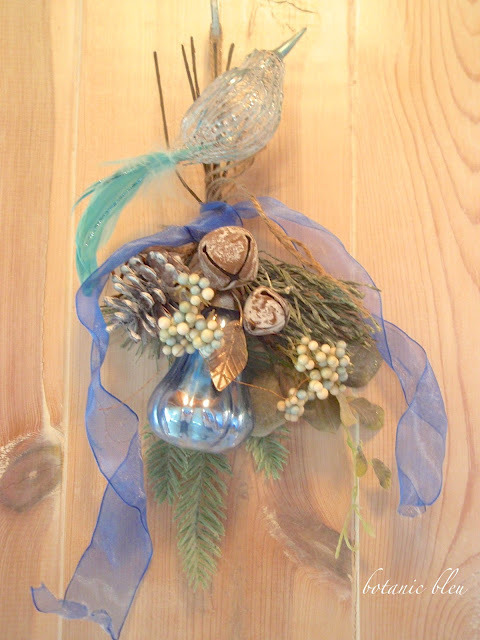 A blue wire-edge ribbon is tied simply, without a bow, around the original swag that includes a very small green branch, one pinecone, two rustic bells, two sprigs of berry clusters, and another small cluster of artificial greenery. By itself, the little swag is nice, but by adding the blue ribbon and one mercury blue pear with silver metal leaf, the arrangement now fits with the existing color scheme in my home. Adding a small green glass bird with a long feathery tail makes the small swag look larger. Hang the small swag from a hook on a door like this entry closet door. Then hang the small green glass bird so it is above the swag. 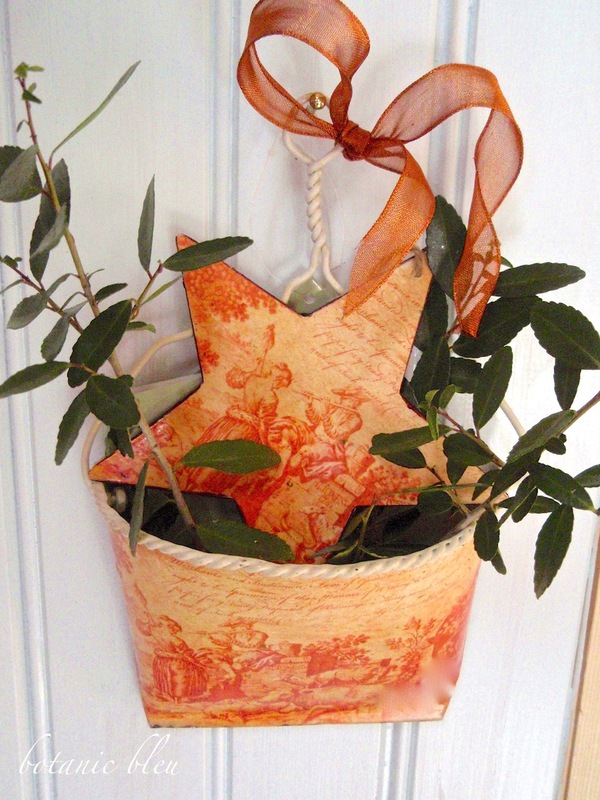 Technically the metal bucket with a toile scene is not called a swag, but can be used in the same small places as swags to add seasonal greenery. While the colors and design are not very Christmasy, the arrangement takes on a seasonal look from the star-shaped coordinating ornament, a snippet of color-coordinating ribbon, and small twigs of wild live yaupon holly. Adding just a little live greenery gives year-round objects like the little French toile bucket a festive holiday touch. No need to replace existing items. 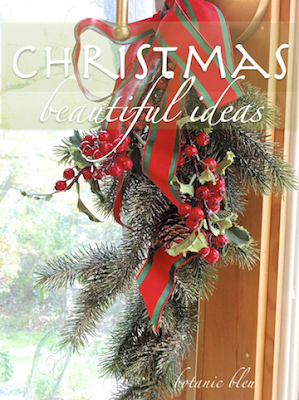 Just add ribbons and live greens for a little French Country Christmas in a flash. All of these small arrangements are easy and FAST. Plus, they can be moved from one place to another even faster. By re-using basic materials, each year new looks can be made by changing ribbons and ornaments. Nothing better for holiday decorating. looked with other Christmas decorations. 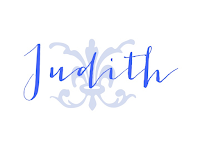 Judith, I love all of these swags! They add such a pop of color and don't overwhelm a space. I always need sometime simple to make for areas that need a little something extra to fill in and love making the swags. After the holidays, I will pull the ribbon off and tie on some burlap ribbon for the winter months. 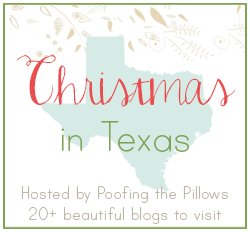 Looking forward to the blog hop! OH yes Judith, what's a holiday home with out a boquet of holiday greenery, or florals of plenty hanging as greet Christmas. Twigs of sorts I imagine? I love your festive spirit here, and looking forward to more holiday cheer here with you soon enough. Such wonderful ideas here today, Judith. I had to pin the white swag because it's different and so beautiful. Thank you so much for posting about the blog hop. I'm beside myself with excitement! I've never displayed a swag, but you have inspired me. I've always hung wreaths. i love all your examples and will try one on my back door this holiday season. Thanks for the festive share. Your swags are lovely. You have such an artistic touch. 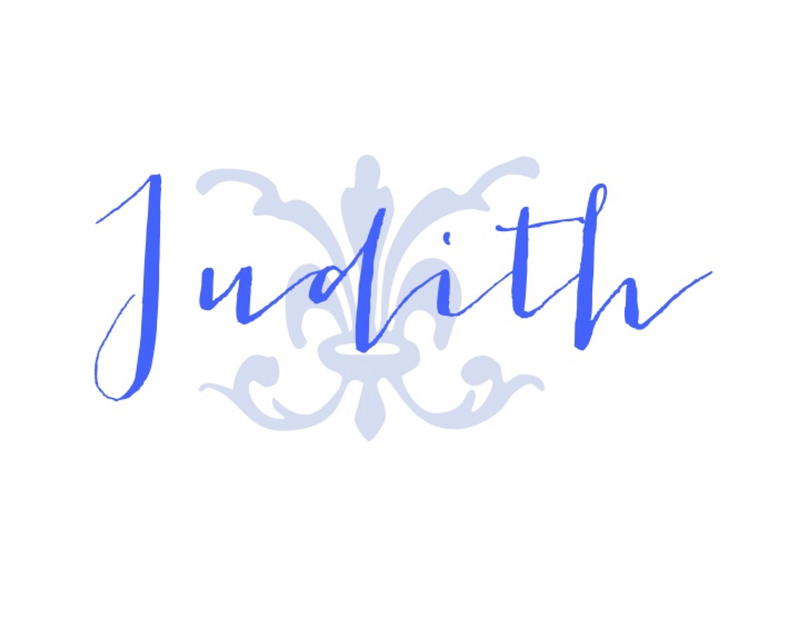 These are all so very beautiful, Judith. I too believe you have 'the touch' to create these so easily! Thank you for your kind comment over at my blog - it truly helps in recovery to have such loving support. Great tips, they are all beautiful!